‘As a woman, if the Honorable Prime Minister of our country can think about the whole country at the age of 71, then why can’t I think about my own society?’ said an excited Nusrat Jahan Lamia after accepting the prestigious Joyeeta Award in recognition of her contribution to her community. The 19-year-old has proved that if someone really wants to bring a positive change in their society, they can succeed – whatever their age. 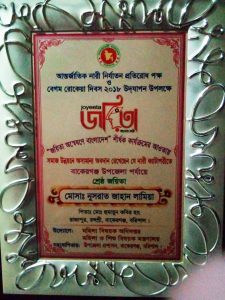 Nusrat received the Joyeeta (‘winner’) Award in the social worker/social development category from the Department of Women Affairs in Bakerganj Upazila in the Barishal district of Bangladesh. The prize is awarded to women who play a significant role in promoting economic self-resilience, social development, education and employment, or rebuilding life after repression. The Joyeeta program, a government initiative introduced in 2011, has had a tremendous impact in raising issues of women’s empowerment – and Nusrat is a very worthy winner. The teenager has always had a strong sense of justice and has never been afraid to speak out, even as a very young girl. When she was just 13 years old, Nusrat visited every house of her village, along with her school Head Teacher, to discuss sexual harassment. She advised other girls to speak up and report harassment rather than ignoring it or staying silent. Remarkably, her efforts led almost immediately to a reduction of sexual harassment incidents in the area. The EYW project has given Nusrat the ideal platform to channel her passion for justice, women’s empowerment and lasting change. In 2014, when she was in grade nine, Nusrat managed to prevent two child marriages, with the support of an executive officer of Bakerganj Upazila and a local police officer. She went on to stop four more child marriages in her area over the next two years. In doing so, Nusrat directly changed – and potentially saved – the lives of six young girls. In 2017, she became involved in the Empower Youth for Work project. This has given Nusrat the ideal platform to channel her passion for justice, women’s empowerment and lasting change in her society. She helps to identify disadvantaged youth to receive skills and entrepreneurial training through the project and, to date, she has provided soft skills training to around 250 young people. Not surprisingly, Nusrat was selected as a member of Union Youth Apex Body and District Youth Advisory Board, and is now also a soft skills trainer for her union. 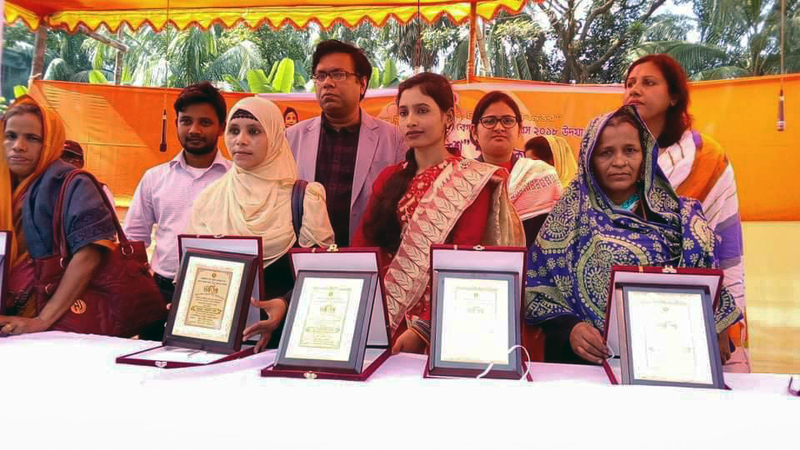 She is also involved in other forums and institutions that help the community, such as the Bangladesh Scouts, free eye-health camps, and various volunteer organizations at local and divisional level. Nusrat never misses an opportunity to interact with other youth groups who have common vision for the development of their society, and she is very good at motivating young people to come up with entrepreneurship ideas. She believes that while change may be driven by young people, it is also necessary to influence elites and elders, and to count them as allies against injustices. Her reputation as a dynamic and impassioned change-maker has steadily grown as a result of her association with the EYW project and Upazila-level representation – eventually leading to the opportunity to work with government stakeholders, and the nomination for the Joyeeta Award. Nusrat received her award on 9 December 2018 during the UN campaign, 16 Days of Activism against Gender-Based Violence. In Bangladesh, this date is known as ‘Rokeya Day’ after Begum Rokeya, a historical figure who is widely regarded as a pioneer of women’s liberation and education in South Asia.